In contrast to week days, Weekends I cook some elaborate meals. This weekend I made this Thai style vegetables in Red curry and Saffron Rice. For the curryI made everything from scratch right from coconut milk. I used the recipe for the Red Curry paste from Sanjeevkapoor. This spicy Thai style vegetables in Red Curry we had with Saffron Rice. I used lime leaves from our garden to flavour the curry . I followed this recipe for Saffron Rice, Except that I made it in the Rice cooker and with our regular long grained white rice-no jasmine rice. Take about xbd cup fresh , grated coconut in a blender along with ~ xbd cup lukewarm water. Blend till the coconut becomes creamy. Sieve through a fine mesh (like a cheesecloth)to get the coconut milk. Repeat this procedure with the coconut 'flesh' and less water one or two times more till most of the milk comes out. 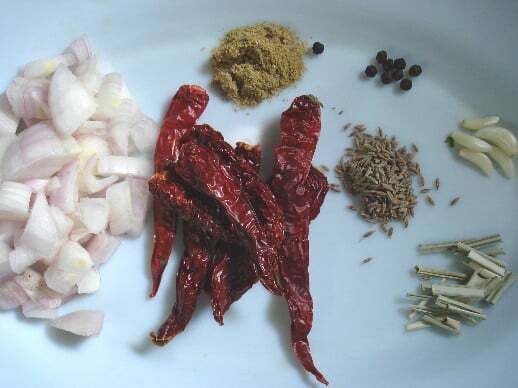 Blend all the ingredients of the Red curry paste together to a smooth paste. Add the mushrooms and sautxe9 till all the water dries up. Add the babycorns and the Mung sprouts. Add about xbd cup water. Cover and cook for 5 minutes. Add the cabbage. Cook for few minutes more. Then add the tofu and capsicum. Cook for few more minutes. Add the red curry paste. Mix nicely and heat on high flame for few minutes. Stir in lime juice and salt and mix nicely. Add the coconut milk , simmer for 2 minutes. Add the lime leaves and crushed peanuts. Looks so delicious! 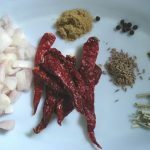 I had thai just yesterday , but in a restaurant…liked your recipe for home made red curry paste…will bookmark this and try it sometime. beautiful presentation. 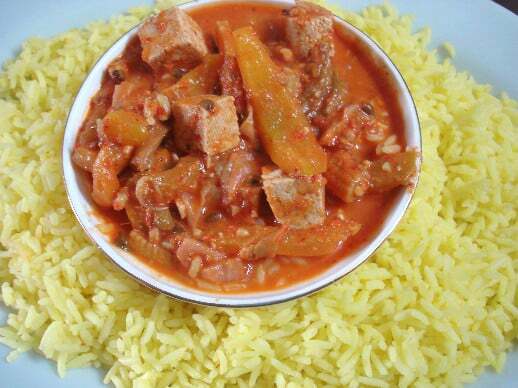 the curry with that saffrom rice looks awesome. Thank you for demystifying red curry paste. Bookmarked! @ Thank you all of you. Happy Independance Day to you all. Happy Independence day to you too. Photos are so good and the recipes too.